British sprinter Mark Lewis-Francis has joined the GB Bobsleigh set-up in a bid to reach both the Rio 2016 summer and Pyeongchang 2018 Winter Olympics. Lewis-Francis, 33, who won Olympic gold as part of the 4x100m relay team at the 2004 Athens Games, missed Beijing 2008 and London 2012 through injury. The GB Bobsleigh team finished fifth at both the 2014 Sochi Games and at last season's World Championships. 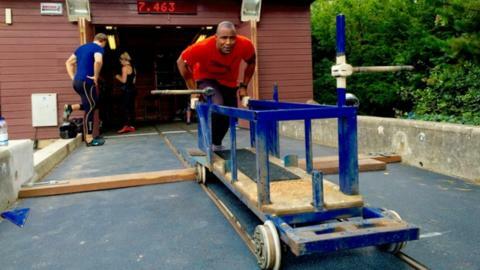 "I can be a great track athlete and a great bobsleigher," he told BBC Sport. "My problem has always been my start and hopefully bobsleigh can help me improve that because I'd love to make the Rio 2016 team." Lewis-Francis insists though that bobsleigh will be his major focus as he is determined to add to his Olympic medal collection. "Some of my greatest moments have come in team events, like the 4x100m relay [in Athens], so bobsleigh plays to my strengths," he said. The 2010 Commonwealth relay gold medallist has also been impressed by the talent he has seen in the British team. "I watched the last Winter Olympics on the TV and was very intrigued, but I've found it's not as easy as it looks and I have so much respect for the guys here," he said. "They [GB] already have a good team and I'm a big lad, I'm strong, I still have a little bit of fast-twitch fibre left too so perhaps with a bit of MLF speed in there we can finish a bit better than fifth." Lewis-Francis' former GB team-mates Simeon Williamson and Joel Fearon are already part of the British bobsleigh setup, whilst fellow 2004 Olympic gold medallist Jason Gardener competed in the 2008 GB Bobsleigh championships. Other ex-sprinters who have previously made the switch include Marcus Adam, Allyn Condon, former world champion GB bobsleigher Nicola Minichiello and Beijing Olympian Craig Pickering. "I was quite surprised when I came here and saw a lot of people that I used to line up against and race," he said. "There's a lot of young sprinters here as well so you can see the making of the switch from athletics to bobsleigh and I think it's good for the sport." USA sprinter Lauryn Williams won Olympic relay gold at London 2012, before partnering Elena Meyers-Taylor to a second-place finish at the Sochi Winter Olympics last year. GB Bobsleigh performance director Gary Anderson hopes Lewis-Francis can make a similar difference for the British team. "To win an Olympic medal in 2018 we need to have one of the quickest start times in the world, we were near that in Sochi but just need that little bit more," he told BBC Sport." On Lewis-Francis, Anderson said: "He is an Olympic champion and has taken to the bobsleigh training really well - it's an exciting time for the team." The Commonwealth 100m silver medallist's eldest child, Romeo, was less than a year old when the men's 4x100m relay team secured victory over the USA in Athens. "Most of my kids are too young to remember 2004," he reflected, and added that a medal "would be amazing and a dream come true. "To have another moment where they can actually watch it and see their daddy actually doing something amazing - that would be great for me." Lewis-Francis has made impressive progress since joining the team for pre-season training in Bath in August and has been selected for the team push start trials in Switzerland later in September. He is expected to make his debut on ice next month with the bobsleigh American Cup series a possible target in late October.